The Lava Flow trail is located in the Sunset Crater Volcano National Monument near Flagstaff, Arizona. The short interpretive trail loops through the Bonito lava flow near the base of the Sunset Crater volcano allowing visitors to closely examine its volcanic geology. Ponderosa pines, apache plumes and various wildflowers grow in sharp contrast to the surrounding black lava making the area a pleasant place to explore. The upper section of the trail is paved and both suitable for strollers and wheelchair accessible. Brochures are available that provide valuable information that corresponds with each of the interpretive trails numbered stops. The lava flow trail consists of 2 loops. 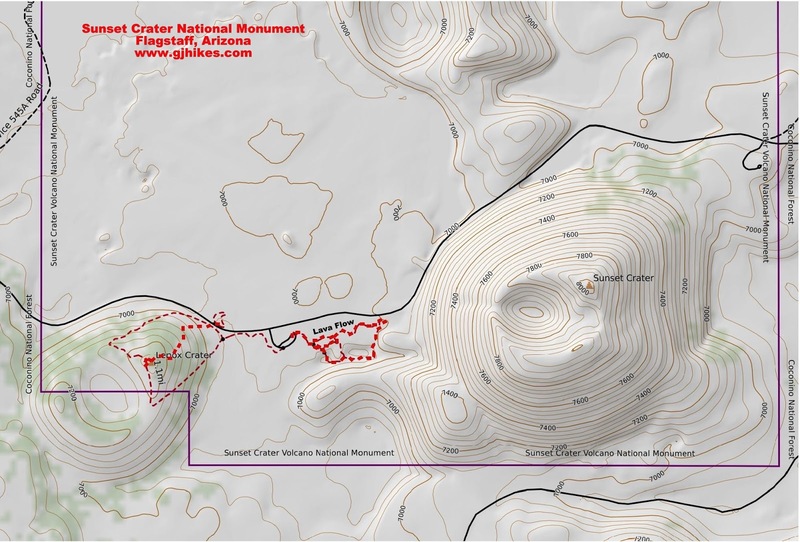 The upper paved section circles the small mesa inside of the larger more primitive trail that travels around the lower area of the lava flow. At one time there was a trail that climbed up Sunset Crater and looped around the rim of the crater. The trail was closed due to severe erosion. Looking at old pictures it appears that there was more than one route that hikers were taking and that is usually a bad thing as far as trail maintenance is concerned. Perhaps if logs or rocks would have been placed at close enough intervals they would have been able to divert the runoff from the trail in small enough quantities to avoid the erosion. Routing the trail through the trees would have also made the trail more stable than the loose cinders on the south facing slope. It's too bad because it sure would be nice to hike up there and see the 300 foot deep crater and take in the view. A set of metal stairs provides easy access to the lower trail. Sunset Crater is the youngest volcano in the state of Arizona. The volcano is among over 600 cinder cones that make up the San Francisco Volcanic Field. The first volcano, further to the west, erupted some 6 million years ago. Each successive eruption is basically a little further east than the last with Sunset Crater being the furthest east. Recent studies have adjusted the time of its eruption from the previously believed date around 1064 to a more recent one around 1085 AD. Before the last eruption the Puebloan Indians had enough warning to relocate and build new villages at Wupatki and Walnut Canyon. Heading around the loop in the counter-clockwise direction the trail climbs a small hill to regain the top of the lava flow. This is a picture of a hornito or splatter cone. Hornito comes from the Spanish word horno for oven. Hornito's form on the surface of lava flows and are created by lava that spurts out of the main tube. A cool draft can be felt coming from a vent that has had a grate placed over it. At one time there was an ice cave that could be visited but it was closed after a partial collapse of the lava tube. The lava seems hard enough but it probably isn't much more stable than a glacier as far as climbing in and around it. A hill of red lava stands out in sharp contrast with the green trees and all of the black lava. There are a lot of places in the Rocky Mountains and the southwestern states where you can hike and see signs of volcanic activity. Most of those areas are much more weathered and less extensive than that of Sunset Crater and its companions. Sunset Crater also has an interesting story line that attends it with the stories of the necessity of the Indians to relocate and the fact that you can visit what became their new homes at Wupatki and Walnut Canyon. Some of the descendants of those same groups of people still live among us today on the Hopi mesas and in other areas. All of that makes the Lava Flow trail even more interesting than just its geology. If you would like to see it for yourself then all you have to do is 'Take a hike'.